The quantum world is complex, but machine learning can help simplify it. If you’re not a physicist, the concept of “quantum” will likely confuse you, or simply put you off. But even for experts, the quantum world can be complex. Luckily, in a world where for nearly every challenge there’s a bespoke robot ready to help, an AI now makes it easier to navigate quantum systems too. In science, the word “quantum” refers the smallest matter or physical entity that can be manipulated and observed. Quantum physics, therefore, refers to the physics of particles so small that they cannot be studied like we would do with regular matter. That’s because quantum particles can behave either as particles or as waves. Scientists believe that quantum systems are capable of various configurations, but when studied they tend to fall into just one. It is either in action or not, alive or dead, so to speak. Schrödinger’s cat, anyone? To analyze other possible configurations, measurements have to be done over and over again. A tedious task that can now be made easier thanks to artificial intelligence. According to a study published in the journal Nature Physics, machine learning can effectively reconstruct quantum systems even with limited data. Like in every machine learning model, the researchers trained their software with data from experimental quantum system measurements. With enough information, the neural networks were able to reconstruct their own systems with great accuracy. 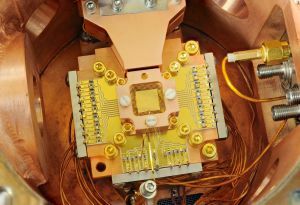 The tests showed that the AI could generate a quantum system — namely working out its various configurations — much faster than conventional methods. For example, the AI reconstructed a quantum system with eight electrons spinning up or down with only around 100 measurements. The same level of accuracy would need nearly 1 million measurements using conventional, brute-force methods.